Leaked teasers for the Lenovo Moto Z reveal the phone may be capable of 10x optical zoom. I’m guessing this will be done through an add-on module, rather than with the main camera. Here’s the teaser image, which features a short poem in Chinese. 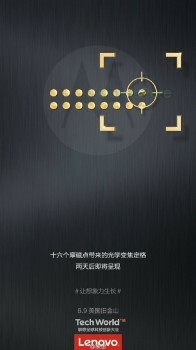 The 16 “magnetic points” are integrated into the teaser image and refer to the 16 pogo pins on the back of the Moto Z, which can be seen in this leak. Another leaked teaser shows a side view of the phone and hints at Silver, Gold and Rose Gold color options. As the teaser images show, the Lenovo Tech World event starts tomorrow, June 9, and will bring the new Moto flagship into the limelight.